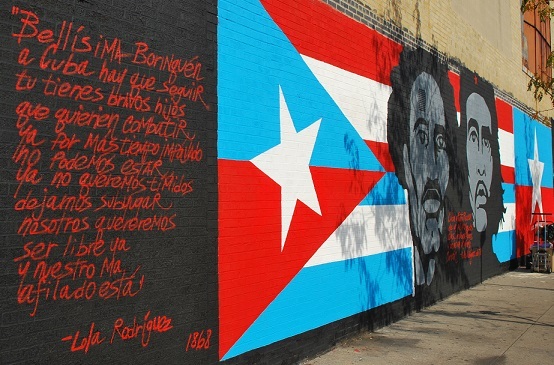 The lyrics of "La Boriqueña" by Lola Rodríguez de Tió grace an East Harlem Wall. que han dado la señal! que es hora de luchar! y sordos a esa señal? a esa señal, a esa señal? La Borinqueña the popular anthem of Puerto Rico first began life as a dance tune in 1860. It became a revolutionary call to arms when lyrics were added in 1868 by the nationalist Puerto Rican poet Lola Rodríguez de Tió (1843–1924). Twice exiled from her native homeland she began to sympathize with Cuban patriots in New York City in 1889. It is in New York where she is alleged to have inspired the future flag of Puerto Rico by inverting the colors of the Cuban flag. Whether the legend of the flag is true or not it does help to strengthen the ties that Rodríguez de Tió had for native Puerto Rico and the island that she would eventually call home for the remainder of her life – Cuba. In 1901, Rodríguez de Tió founded the Cuban Academy of Arts and Letters as she continued to write patriotic poetry about the hopes and aspirations of her two nations. One of her better known offerings from this time, Cuba y Puerto Rico son... espouse these beliefs. As for La Borinqueña, her lyrics were deemed to subversive and were replaced in 1903 with lyrics written by Manuel Fernández Juncos. Nationalist forces in Puerto Rico today use Rodríguez de Tió's version of La Borinqueña for their cause. The English translation of her lyrics follow. The call to arms has sounded! for it is time to fight! with the roar of the cannon. to let them subjugate us. is the duty of the heart. also will know how to fight.